Years ago when I lived in the big city, there was a wildfire in California that sparked evacuations and made national news. I remember someone in the city saying, "I can't imagine my home being in danger of burning because of a forest fire." 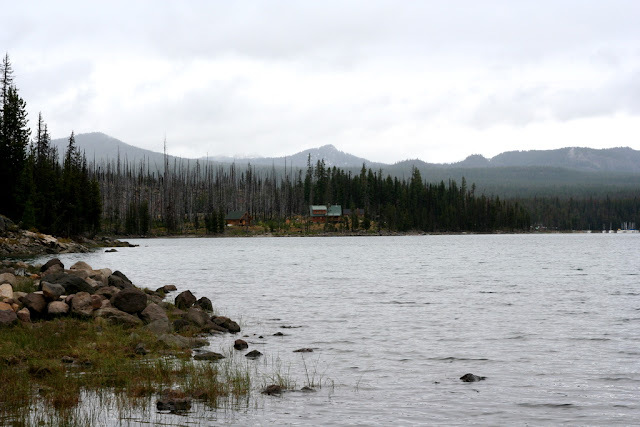 But having grown up in the Northwest where many of my friends and some of my family spent summers working for the United States Forest Service and the State Forestry department, I was very aware of the danger. I could imagine it. But I also knew that in the big city campgrounds were often separated from suburban housing developments by just a small treeline. The person who made that statement might never have driven through a National Forest after the fire. Around here, it's a sight I can see driving in just about any direction out of town. Sundays have been my only day completely off work lately. I've tried to take advantage of the afternoon and drive out of the mountain town and into the forest. Yesterday it was storming and pouring down rain. It wasn't a good day for a hike to my favorite perch. I still wanted to get out of town. So I drove the scenic byway. Through the mountain. Passed the high lakes. One big loop out of town and back again. One of the last lakes I passed has been the sight of a couple of major forest fire in years past. The forest floor as I drove by was littered with matchstick like remnants of the pines that once reached for the sky. Where trees once stood shoulder to shoulder blocking the view, they now grew in spurts. One here. Two there. With plenty of room between them. White trunks bare with green needle poms only at the tip top of the branches. Every time I pass the site of a forest fire, I can't help but think how beautiful it is. Please don't get me wrong here. These wildfires are devastating. Fires this month alone have claimed multiple lives and homes in Oregon alone. They are not beautiful when they happen whether the first spark was caused naturally, or by human interference, intentional or not. But wildfires are a natural process, at least those not man-made. The beauty is in the forests ability to recover. To heal the scar left on these mountainsides. Trees begin to grow again. Animals return. Did you know the best place to hunt for morel mushrooms is in the soil a year or two after a forest fire has swept through the area? Shortly after I passed the site of the fire, I was pelted with severe hail. I tensed up as it felt like gravel hitting my windshield. The sky was clouded dark, and flashes of lightening barely broke through the clouds. Almost as if someone kept hitting the dimmer switch on the sun. On and then off. And on and off again. I was thankful I'd finally gotten around to replacing my useless windshield wipers a couple of weeks ago. Just some rain. I had no idea what was coming. Minutes later, just as quickly as it started, it stopped. The rain slowed. A break in the clouds reveled a blue sky. 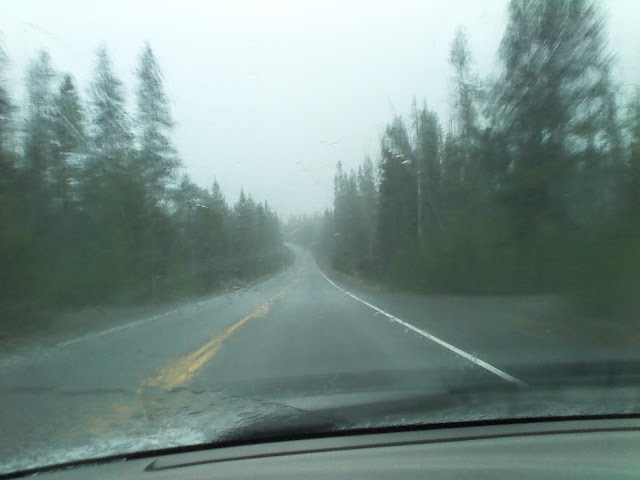 I could see individual raindrops as they fell hundreds of feet from above the treeline. White hail sprinkled the roadside like a dusting of powdered sugar. It took another 30 minutes for a warning to come crashing across the radio station. The National Weather Service was warning those north of me to expect the storm I'd just driven through. Thinking about the fire and the storm, now thought to be one of the worst in this area in years with over 6,500 lightning strikes, I can't help but think of the people I know facing storms in their lives. Death. Unemployment. Infertility. So much hurt and loss and pain. Like me on the highway yesterday, we don't always get a warning of trouble ahead. I don't know how these scars will heal, or how long it will take. But they will. For even the forest grows again, and the sun breaks through the clouds after the storm has passed. This is beautiful Shelby, thanks for sharing your heart. Thanks, Nike. And thank you for being such a faithful reader. Sending hugs your way. Hang in there! I hope you didn't take the photo while driving..